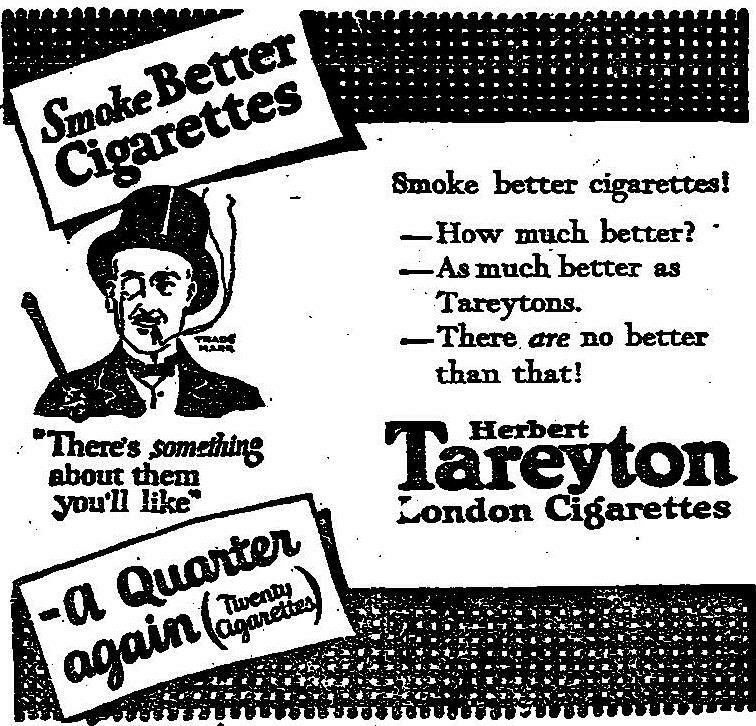 In the 1960s and 1970s, the advertising campaign for Tareyton Cigarettes upset grammarians, teachers and others. 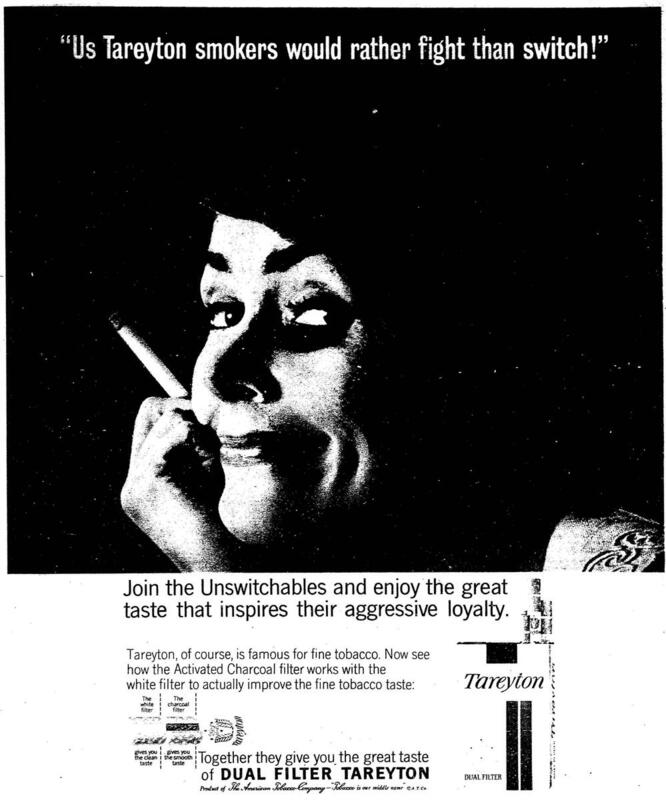 “Us Tareyton Smokers Would Rather Fight Than Switch,” the ad copy proclaimed. The accompanying pictures showed smokers with a black eye. 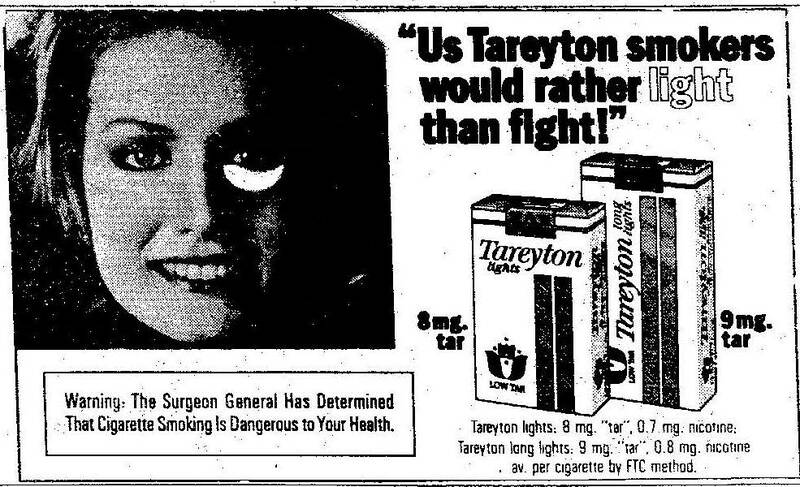 In the late 70s, when Tareyton introduced a light cigarette brand, the copy became “Us Tareyton Smokers Would Rather Light Than Fight.” The black eyes were replaced with a white patch in the same shape. 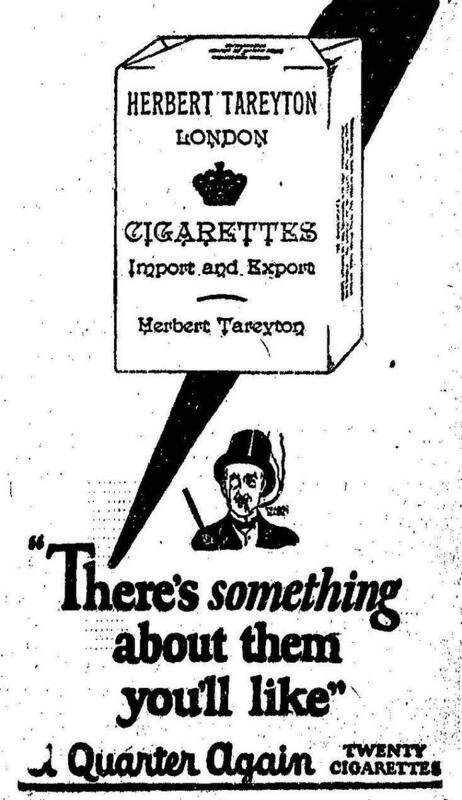 This was a long way from how the cigarette was marketed in the early part of the 20th century, as seen in this example from the 1918 Seattle Times. 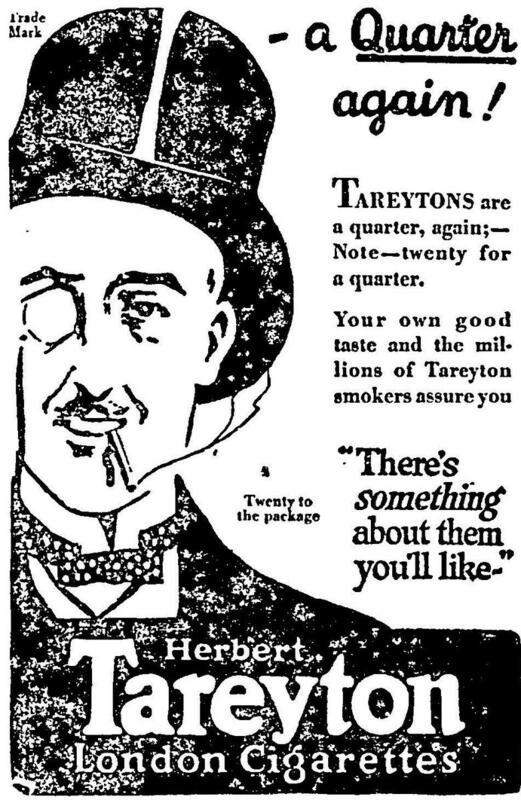 To begin with, Tareyton had a first name—Herbert! And the tag line was “There’s something about them you’ll like.” There was a centered portrait, presumably of Herbert himself. He wears a top hat and suit, has a monocle in his right eye, carries a walking stick and, of course, smokes a cigarette. He’s an urbane gentleman out for the evening. “Twenty for a Quarter” completed the copy. 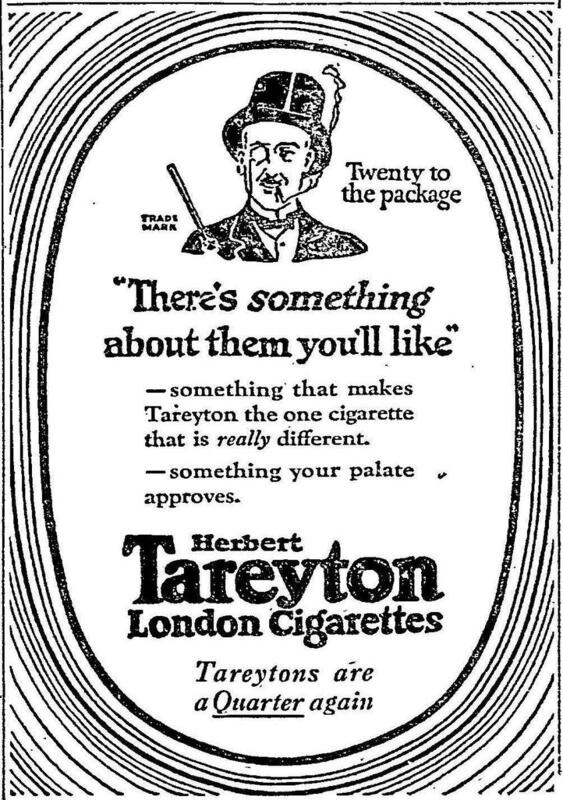 Smoke Herbert Tareytons, the ad seems to say, and you too can be a gentleman. 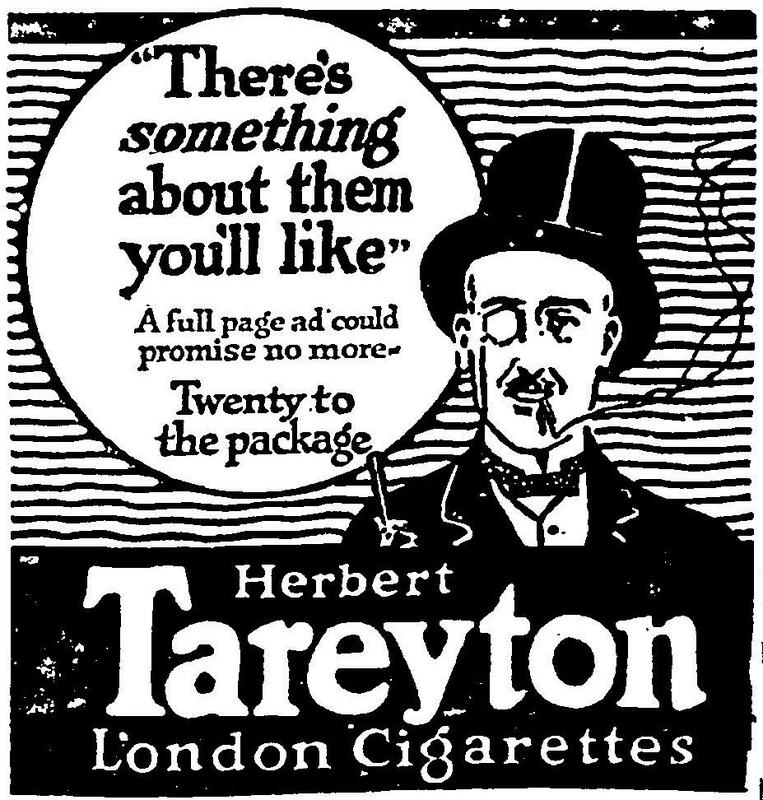 In 1921, Herbert was off-center in a small square ad, and in a circle the text now read “There’s something about them you’ll like. A full page ad could promise no more. Twenty to the package.” The price wasn’t mentioned. 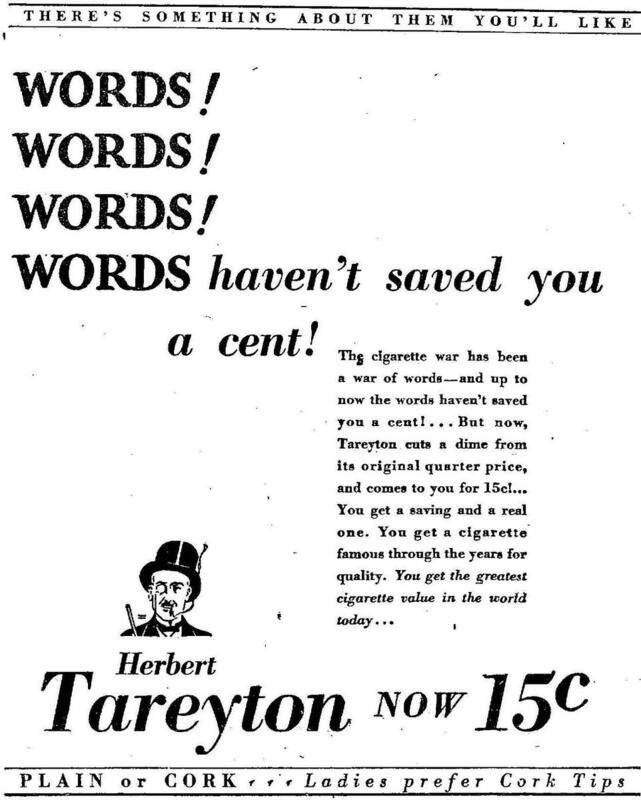 In 1922, the following year, Herbert moves to the left side of the ad, and there’s more text: “A Quarter again. 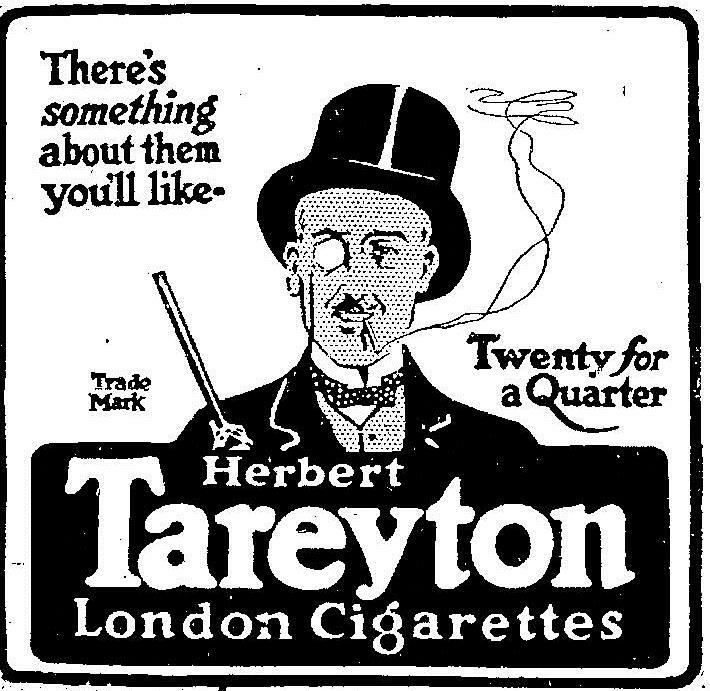 Tareytons are a quarter, again; —Note—twenty for a quarter. 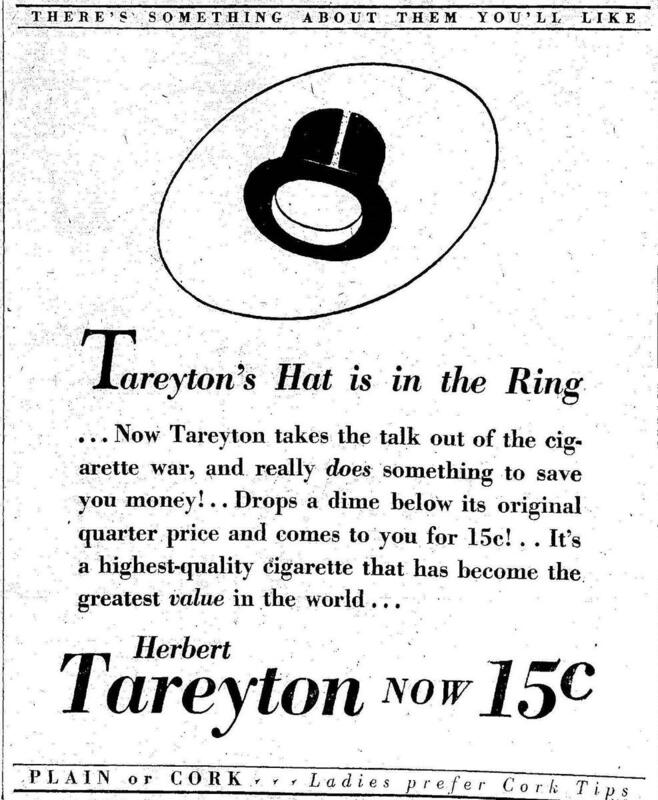 Your own good taste and the millions of Tareyton smokers assure you ‘There’s something about them you’ll like.’” Price must have mattered. 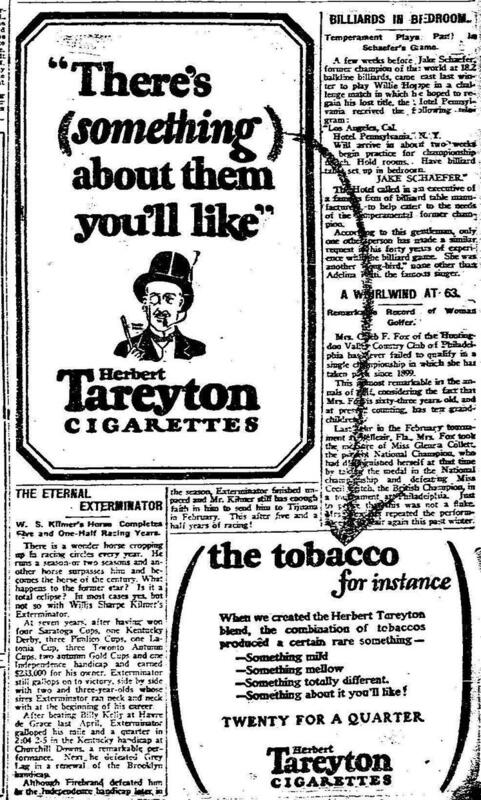 Four months later, in October 1922, the ad changes again. Herbert’s head and shoulders float in the top third of an oval, untethered from the name of the cigarettes. Now the text reads “Twenty to the package. 'There’s something about them you’ll like.' It isn’t this—it isn’t that—it isn’t the other thing. It’s the quality combination of all—it’s Tareyton….Tareytons are a Quarter again.” It’s something, but apparently it’s indescribable. Well, that new approach didn’t last long. In September of 1923, the ad size is bigger, but not full page. Herbert’s jaunty head and shoulders now float about a third of the way up. Dangerously suspended over his head is a large pack of Herbert Tareytons. There’s a bold black slash behind it which leads the eye right to the enduring tagline. Then they got radical. Something you’ll like? What is that something? It was time to answer the question. They used two ads on the same page. The top one has the old tag line, but “something” appears to be within crayon-written parentheses. The same crayon leads the eye down the page to the second ad. And the “something” is revealed: “The tobacco for instance. 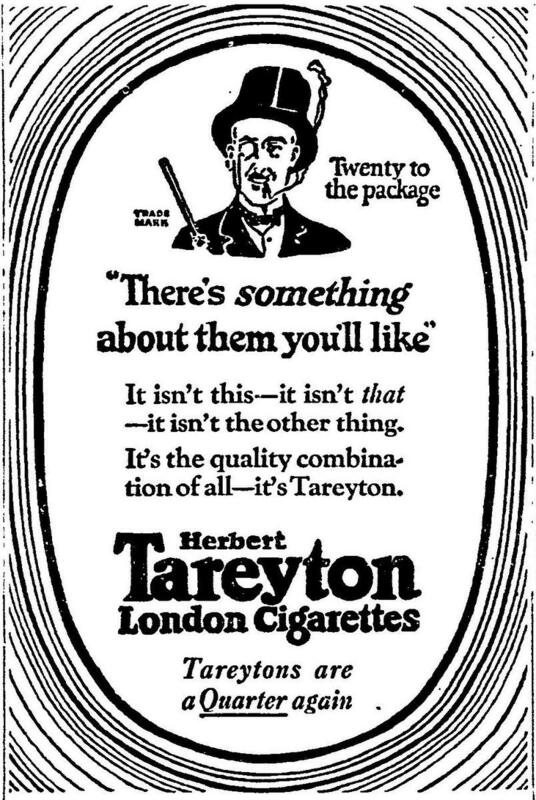 When we created the Herbert Tareyton blend, the combination of tobaccos produced a certain rare something—Something mild—Something mellow—Something totally different. —Something about it you’ll like!” All these years and it’s the tobacco! On July 17, 1928, different versions of an ad were run on the same day in two different papers. Now there’s a price war going on. Herbert has dropped his premium price by a dime! Only 15 cents for all that “something.” Readers in Cleveland were told: “Words! Words! Words! Words haven’t saved you a cent!” And Herbert’s body is lost again. But in the other ad it is even worse. For readers in Portland, only an empty top hat remains! Herbert is gone. Let’s leave him to his solitude. For more information about America’s Historical Newspapers, or to request a trial for your institution, please contact readexmarketing@readex.com.